Like much of British skilled industry, a decline began during the 1970s, prompted by the development of off the shelf hydraulics, pneumatics and electronics which simplified the task facing new competition. This coupled with changes in ownership, resulted in a final messy closure in 2000. An excellent concise history of the BU exists on Wikipedia (including mention of this BU History Group). In addition: ‘Serving the Shoemaker for 100 Years’ by Iain Howie (1999), ISBN 0-9536531-0-2. , is a superb, and thorough history of the BU, published to mark the company’s centenary. Since closure in 2010 the majority of the remaining BU factory buildings have been demolished to make way for housing (the development continues at the time of writing, May 22nd 2013). The original Union Works building, facing Belgrave Road, and a section of the old factory on Law Street, still exist. Although no longer in BU active service. BU History Group was formed in 2012 with the aim of recording the history of the BU from the people who were connected with it. Although not many years since its demise the stories of this powerhouse, not only of Leicester’s history, but of recent British industrial history, are disappearing fast. Our aim is to share the story of the BU through this website. To this end the group received financial backing from the Heritage Lottery Fund in 2012. 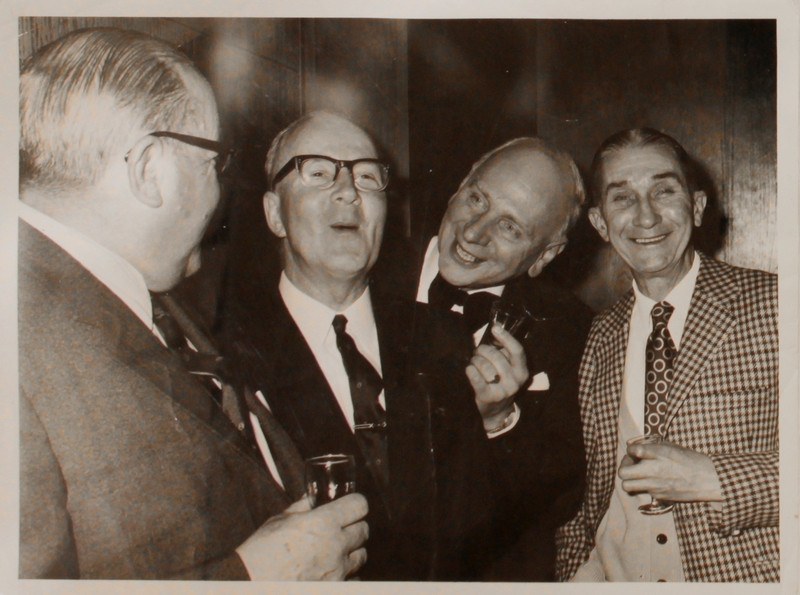 Paul Gill, Dave Tipton, Frank Bramley, Mick Lambell and Burt McNeill. We hope you enjoy the website and we encourage you to contribute by registering and then ‘Commenting’ on existing stories, or by ‘Posting’ new stories and images of your own. 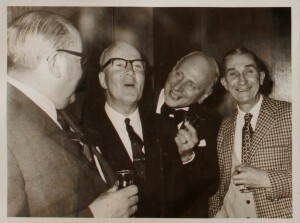 This website is dedicated to Herbert Harrison, 1913-2012. Bert started work at BU in 1927 as a 14 year old apprentice. He retired 51 years later in 1978 as Foreman in the Knife Shop. Here he is pictured second from the left with Mr Kinder, Eric Johnson and Sis Hawksworth. They are at a Samco Quarter Century Dinner in Bristol. Submit a story of your own!